What’s new in comic book movies? Something old, in the case of Shazam! (Rating: B-) which was the first comic to be adopted into a film series back in the 1940s, though in those days he was Captain Marvel (see news of our podcast below), a 14-year-old boy who turns into a buff superhero by uttering the phrase, “Shazam.” Our reviewer Thom Ernst found the new reboot uneven, tired in the magical comic book origin tropes but funny and entertaining when Zachary Levi is unleashed as the super-dude with the kid’s mind. Charlie Sexton in the doc Carmine Street Guitars. Should we just let buried pets lie? That’s the unintended message from Pet Sematary (Rating: C-), the remake of the 1989 movie based on Stephen King novel. Once again, a Boston family with a grumpy cat moves to a rural home, encompassing a pet cemetery on haunted ground. Jim Slotek found the new version the new film a low point in King adaptations, tearing out the guts and stuffing it with exposition. Sunset (Rating: B-) is the sophomore film from Hungary’s László Nemes (the Oscar-winning Son of Saul) set in Budapest before the First World War. Visually fascinating, narratively impenetrable, Sunset follows a young milliner (Juli Jakab) who arrives in the city a “roiling pot of fancy costumes, class hatred, vicious misogyny and official corruption” says reviewer, Liam Lacey. For a less Euro-centric historical drama, we recommend Edge of the Knife (Rating: B+), a film entirely in the Haida language (spoken by about 20 people), which recreates pre-contact Haida life and mythology in a traditional story of a man, maddened by guilt to the point of supernatural possession. 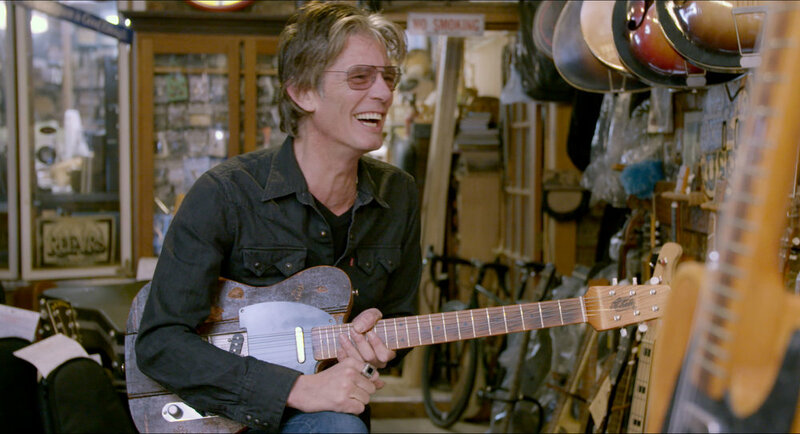 Guitar heads will love Carmine Street Guitars (Rating: A), director Ron Mann’s affectionate documentary about New York music store proprietor and luthier, Rick Kelly, hanging with his famous musician friends. The Invisibles (Rating: B-) is a hybrid documentary-drama about four Jewish women and two men who managed to survive the Second World War in Berlin, where the static aged interview subjects are fascinating but the dramatic enactments feel stilted. Finally, Jim Slotek looks at Acquainted (Rating: B-) by former De Grassi: The Next Generation actor Natty Zavitz. It’s a wry serio-comedy about two young couples exploring such favourite Toronto topics as emotional affairs, questionable decisions, and home ownership. In this week’s podcast, we talk about the trailer buzz for Joaquin Phoenix in Joker; the best Batman, the history of the competing male and female versions of Captain Marvel… not to be confused, of course with The Marvelous Mrs. Maisel.